Plot: Without giving anything away, the film is based on the real events of the missing Civil Rights workers James Earl Chaney, Andrew Goodman, and Mickey Schwerner. The three disappeared in Mississippi in 1964 while on a trip to encourage black citizens to register to vote. The film focuses on the investigation, and the full weight the FBI put into the case. It pretty much sticks to the true story, so that's the most story line I will reveal. Why you should watch it: While sorting through my DVDs, I came across this gem, forgetting just how good of a film it is. I will sum it up in one word: tense. It's a very heavy and serious film that details just how ingrained one culture was in denying basic civil and human rights towards another. It's not a "fun" movie, nor are there any real elements of lightness or joy. 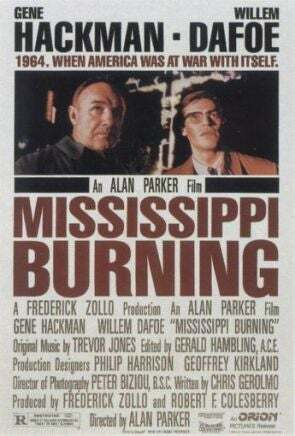 Mississippi Burning is more of a serious and cautionary story, but one that everyone should see. The acting in the film is outstanding, across the board. Gene Hackman and Willem Dafoe play two FBI agents with differing investigatory styles. Hackman's Agent Anderson hails from the South, so his character knows what they're in for. Dafoe's Agent Ward is more by-the-book, and his character is from the North, so he really has no idea how ingrained the culture of hatred and prejudice is. Sartain and Dourif portray the local law exactly as one would imagine them to be in a racially charged environment. Their characters have known segregation their whole lives, and they'll be damned if any Northerner is going to force them to change their ways. The always steady and professional Frances McDormand is once again solid in her role as a beleaguered wife, one who doesn't agree with her husband and his racist ideology. McDormand is the poor man's Meryl Streep, and she once more proves her versatility in this challenging role. Alan Parker is a steady director. With the exception of Midnight Express, none of his films could be considered remarkable or earth-shattering. Mind you, I'm partial to Pink Floyd - The Wall, but that's another story. Parker handles this material with a very deft touch. When making a movie about racism, it's easy to make it safe and fluffy, so that everyone can sing Kumbaya at the end and pretend that everything has been fixed. However, Parker does what a good filmmaker should - he shines a light on everything, warts and all. He shows the ugliness of prejudice, the rippling effect it has on a community, and the horrors that human beings are capable of. The material is bleak and harrowing, but Parker never lets that overwhelm the viewer. He walks the tightrope with aplomb, and achieves a fantastic and hypnotic film. Finally, this film serves as a reminder that prejudices are taught and ingrained, but change is possible. The more light that is shed on a bad situation, the more likely that situation is to change. The more we as a society grow and become accepting (not tolerant, but accepting), the better it will be for all people. I truly believe we are headed in that direction. However, those who forget the past are doomed to repeat it, and Mississippi Burning will stand as a cinematic monument to where we as a society were, and how far we still need to go. This is a very important film. The trailer gives just an idea of how strong of a film this really is.